I borrowed this book from a rat loving friend, who first picked it up because of the front cover. She had nothing but good things to say about it (probably because in the story, rats are treated like royalty! ), and told me that it felt a bit like an adult version of Harry Potter. It seems to me that readers are always trying to fill the Harry Potter shaped hole in their bookshelves. One of the things I most loved about Harry Potter was the fact that it was set in a school, so I’ve always found it a bit hard to imagine an adult version. But still, my interest was piqued! Neverwhere is the first full-length novel by Neil Gaiman that I’ve read but I’m familiar with his writing style because of Fragile Things, a collection of his short stories. I had mixed feelings about that book and can see why people might not get on with the odd expressions and quirky style. However, Neverwhere, being a longer story, gives the reader time to get into the flow of the writing. The whole idea of the book is very intriguing. It’s mostly set in London Below – a much darker and grittier London than the one that most of us are used to – a place where people end up by ‘falling through the cracks’. This fascinating, topsy-turvy city that exists underneath the streets of the capital is made up of dirty sewers, abandoned tube stations and dark corners where foul creatures lurk. Richard Mayhew is the bumbling and endearing unlikely hero of the novel. He’s dragged into this strange world by an encounter with a girl called Door. One good deed is all it takes to involve him in Door’s revenge quest to find the people that murdered her family. Helped out by some rather eccentric characters, Richard and Door scurry through London Below, trying to find the truth. Never far away are Mr Croup and Mr Vandemar, a couple of the most creepy and revolting villains I have ever come across! I thoroughly enjoyed escaping into London Below, but was glad that I was only a visitor – I certainly wouldn’t like to get stuck down there! Neil Gaiman invents the most wonderful places – such as the magical Floating Market – and the most bizarre characters – my favourite being the sarcastic and arrogant Marquis de Carabas, who delivers some of the funniest backhanded comments! Neverwhere is a little bonkers and full of laugh out loud hilarity, as well some scary moments of tension. I think Gaiman most have had a lot of fun creating this world and hope to read more of it one day! If you would like to enter the wild world of London Below, you can buy the book by clicking the picture below! Yes, I seem to hear nothing but good things! He’s definitely worth a try, although I don’t understand why his style doesn’t put people off. Obviously most people like a bit of quirkiness! I read this last year, and really enjoyed it. I agree the writing is a little quirky, but once you get into it, it is very clever. 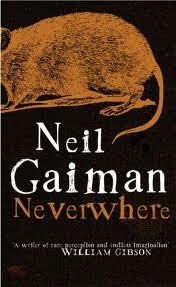 my review is on http://fennellbooks.squarespace.com/journal/2011/5/28/neverwhere-by-neil-gaiman.html. I have heard that American Gods is excellent. Thanks for the comment. I’ve just checked out your review and made a comment. I agree with what you say about the characters! I just finished reading Stardust by Neil Gaiman, I was a little disappointing actually, although I’ve heard that it is quite different compared to his other ones. I thought one of the best things about it though was his quirky style like you mentioned. 🙂 This book sounds much more interesting, and your review makes me want to give it a try! I’ve been wanting to read Stardust. I have to admit, I didn’t even realise it was a book until this year! But I really enjoyed the film, so hoping I’ll like the book too. The quirky style is a definitely one of his strong points (if you like quirkiness, anyway!) But I do have to be in the mood for it. I didn’t enjoy all of his short stories because I felt like there was something missing and that the quirkiness took over. One day I’ll read Stardust and let you know what I think – I look forward to reading your review when you put it up! Ahh yeah, I watched the film first, also not realizing that it was a book until a bit later! I feel like that may also have affected my thoughts on the book slightly. Sounds fabulously quirky-I like the character names! I’ve wanted to read Gaiman for a while but had American Gods in mind. This sounds great too though from your review, thanks! Thank you for the comment! Everyone seems to have a different favourite by Gaiman, which I see as a good thing – it means all his books must be worth a read! Lots of people recommend American Gods, and I’ll definitely be giving it a go at some point. Let me know your thoughts when you read it! Sounds like I will love this! I’ve been thinking about reading American Gods for ages now. You have just doubled my curiosity! I’ve heard American Gods is also really good. I think I’ll wait a while before I read another book by Gaiman though. I do love his writing style, I’m just not sure I could read more than one book in a row. I’m hoping to gradually get through them all though. Let me know what you think when you’ve finished American Gods! Sounds fun! Made me think of an ancient Dr Who episode where there are giant rats in the sewage canals under London… (I was very young and it gave me nightmares!) LOL! I LOVE THIS BOOK! I used to live in London, and this fantasy, skewed way of looking at the city somehow made it make a little more sense than it did before, as well as being a cracking great story. I reread it every year now. I loved seeing all of the side characters in the book; people like Old Bailey or the Earl are hard to forget. The side characters reminded me of random characters in Alice and Wonderland popping out of nowhere, spewing nonsense and being generally silly! I hope that one day Neil Gaiman will write some back stories to these characters!